Fill your espresso machine with espresso, packing it down as you go with the back of a spoon to pack in the espresso. Follow the manufacturer’s instructions for whatever type you have. For mine, I place the water in the bottom, up to the steam section, then add the espresso in the middle section. I screw on the “pitcher” which is the top, and place it on the stove top, with the lid flipped off. Once it starts brewing, close the lid. When the espresso has finished brewing, you will proceed with the following steps. Heat 1 cup vanilla soymilk (or milk) with 1 Tablespoon sugar (if desired) and 2 Tablespoons cinnamon simple syrup in the microwave while espresso is brewing. Place heated soymilk (or milk) in the blender (can also shake in a mason jar after heating). Blend to create frothy consistency. Slowly pour frothy soymilk (or milk) mixture into mug. 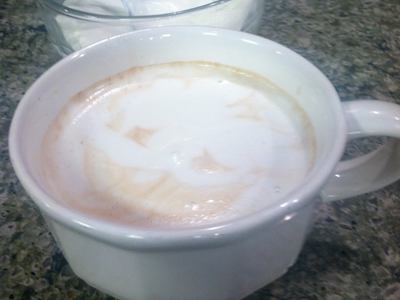 Add espresso to the soymilk, then top with whipped cream. This is such an easy, inexpensive way to have a treat at home! To make homemade whipped cream, with a whisk or hand mixer, beat heavy cream. (Always start with a cold bowl and beaters that you have placed in the freezer) Add sugar and whisk or beat until desired consistency for whipped cream. Set aside.